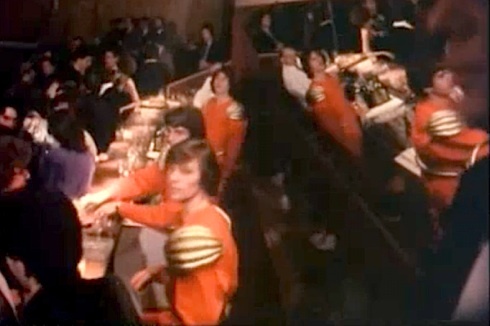 For five years from its opening in March 1978 Le Palace in Paris ruled as Europe’s most fashionable nightclub, creating its own myth as much by throwing couturier balls as by cladding its cool staff in crimson and gold tunics designed by the young Thierry Mugler. 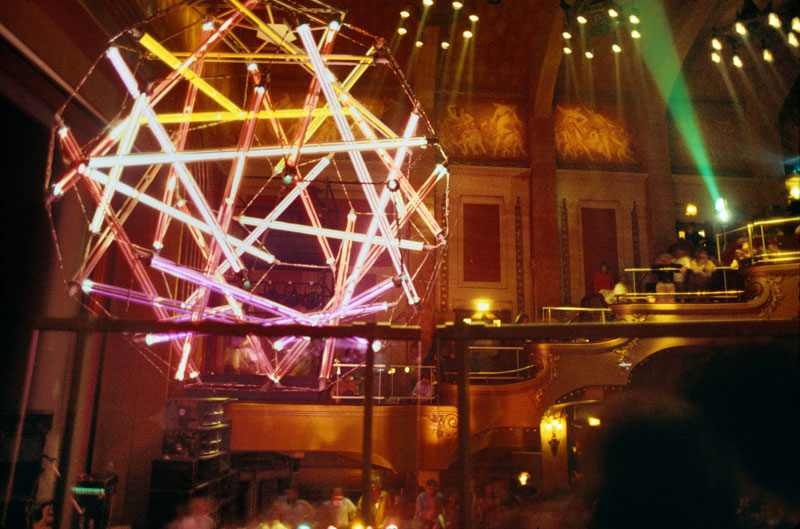 Nightlife leader Fabrice Emaer removed the seating from this intimate former music hall to create a discotheque where the glorious Art Deco interior vied with a light show that was state-of-the-art in an era when excess was only starting to define the possibilities of the high-tech ultra-disco. 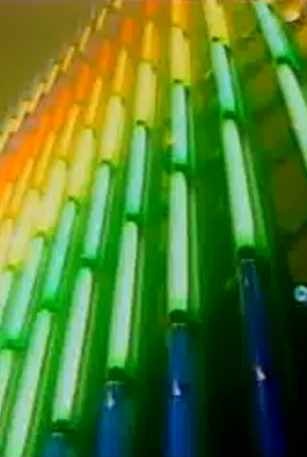 The centrepiece was a preposterous mothership of strobing tubes that descended slowly into the midst of the dancers. During the course of an evening, the ancient safety curtain, decorated with advertising from the 1930s, slowly rose to reveal an artful stage setting, which imperceptibly rearranged itself as if invisible scene-shifters were at work. The high point of the night followed the lowering of another, new stage curtain that suddenly erupted into a huge, dazzling wall of orchestrated light which cascaded from floor to ceiling. ◼ I CONFESS I AM UNABLE TO INTEREST MYSELF in the beauty of a place if there are no people in it (I don’t like empty museums); and conversely, in order to discover the interest of a face, of a figure, of a garment, to savour the encounter, I require that the site of this discovery have its interest and its savour as well. Which may be why Le Palace beguiles me. I feel relaxed there. It’s modern—even very modern? Yet I recognize here the old power of authentic architecture, which is conjointly to enhance the moving, dancing bodies, and to animate the spaces and the structures. These days, theatres die easily. The hall where I saw my first Beckett is now a garage; others become movie houses, give way to apartments. Le Palace is a rescued theater; first of all because shows will be given here; then because, from the theatre it originally was (and several times over), everything has been preserved: stage, curtain, balcony, orchestra (transformed into a splendid dance floor, but from which you can see the show, standing or sitting on cushions), the great swathes of red velvet. Inveterate emotion: to climb a staircase and emerge into a huge space, crisscrossed with lights and shadows, suddenly to enter, like an initiate, the sacred space of representation (even and especially when, as here, the show takes place throughout the entire hall). Theatre: this Greek word comes from a verb that means “to see”. Le Palace is certainly a site dedicated to looking: you spend your time looking at the hall; and, when you come back from the dancing, you look some more. Le Palace is well proportioned. This means that you are not afraid here (you would not mind sleeping in it): too small, a theatre is stifling; too big, chilling. Here you can circulate—up, down, changing places according to your whim—a freedom always frustrated in other theatres, where everyone is assigned a seat, the one corresponding to his money. Yet freedom is not enough to make a good space. Certain experiments have shown that the little white mouse suffers great anxiety when placed in an empty arena lacking any point of reference. To feel comfortable in a space, I must in fact be able to proceed from one reference point to another, to inhabit a corner as well as a platform, and, like Robinson happy on his island, to make my way in comfort from one domicile to the next. At Le Palace, the familiar places are many: a salon for chatting, bars to meet in, to rest in between dances, a belvedere from which to gaze, above the intervals of the balustrades, down at the immense spectacle of lights playing over bodies. From each place where I take up my position, I have the delightful impression of occupying a sort of imperial box, from which I can master all that happens. Is not the great raw material of modern art, of our daily art—is it not, in this era, light? In ordinary theatres, light is remote, fastened to the stage. 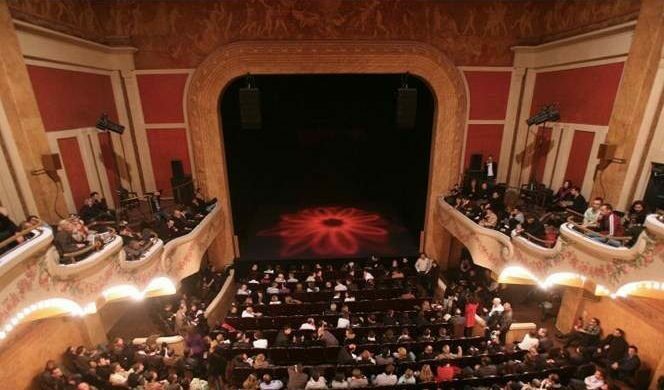 At Le Palace, it is the whole theatre that is the stage; here light occupies a deep space, within which it comes alive and performs like an actor; an intelligent laser, with a complicated and refined mind, like an exhibitor of abstract sculptures, produces enigmatic traces, with sudden mutations: circles, rectangles, ellipses, tracks, cables, galaxies, fringes. The remarkable thing is not the technological prowess (though that is rare enough in Paris), but the appearance of a new art, in its material (a mobile light) and in its practice; for this is actually a public art, in that it is achieved among the public and not in front of it, and a total art (the old Greek and Wagnerian dream), where scintillation, music, and desire unite. This means that “art”, without breaking with past culture (the sculpture of space by laser may indeed recall certain plastic efforts of modernity), extends beyond the constraints of cultural training: a liberation confirmed by a new mode of consumption: we look at the lights, the shadows, the settings, but also we do something else at the same time (we dance, we talk, we look at each other): a practice known to the ancient theatre. At Le Palace, I am not obliged to dance in order to sustain a living relationship with this site. Alone, or at least somewhat apart, I can “dream”. In this humanized space, I can exclaim to myself now and then: “How strange all this is!” Strange, the old stage curtain, where I read an advertisement for la French Line: Le Havre-Plymouth-New York (bizarre: in this chain of places, it is Plymouth that sets me dreaming: perhaps the romantic myth of the port of call?). Strange, the dark dancers (backlit) in the mist that momentarily covers the floor, articulated like puppets under a ceiling of red and green rays. Strange, the revolving mirror. Strange, the sooty, Hellenoid frescoes that run like a slightly dated chastity along the upper walls. 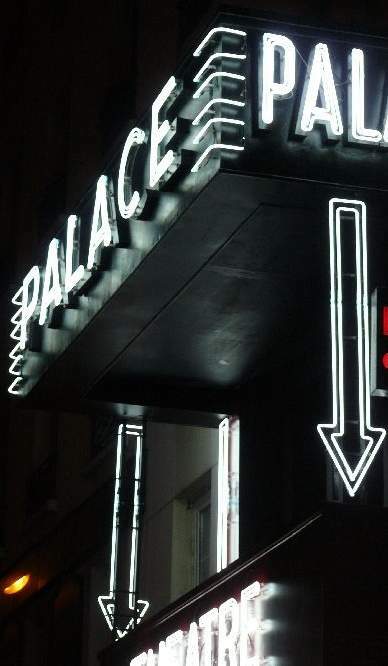 Le Palace is not a boîte, a “box”, as we French call a nightclub: it collects in an original site pleasures ordinarily dispersed: that of the theatre as an edifice lovingly preserved, the pleasure of what is seen; the excitement of the Modern, the exploration of new visual sensations, due to new technologies; the delight of the dance, the charm of possible meetings. All this combined creates something very old, which is called la Fête and which is quite different from Amusement or Distraction: a whole apparatus of sensations destined to make people happy, for the interval of a night. What is new is this impression of synthesis, of totality, of complexity: I am in a place sufficient unto itself. It is by this supplement that Le Palace is not a simple enterprise but a work, and that those who conceived it may regard themselves with good reason as artists. Would Proust have liked it? I don’t know: there are no duchesses any more. Yet, leaning down over the dance floor of Le Palace throbbing with coloured beams and dancing silhouettes, divining around me in the shadow of levels and of open loges an entire ebullition of young bodies busy in their unsuspected circuits, I seemed to recognize, transposed to the modern, something I had read in Proust: that evening at the Opéra, where the house and the boxes form, under the young Narrator’s impassioned eye, an aquatic milieu, gently illuminated by aigrettes, by glances, by jewels, by faces, by gestures suggestive of those made by undersea deities, amid which sat enthroned the duchess of Guermantes. Nothing but a metaphor after all, travelling from far back in my memory and arriving to embellish Le Palace with a final charm: the one that comes to us from the fictions of culture. 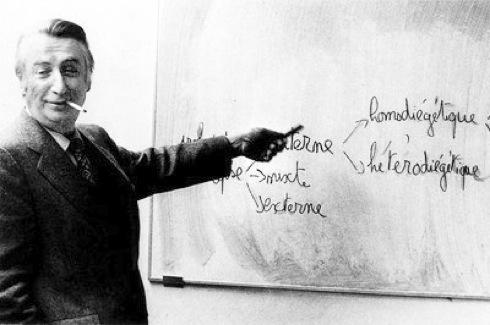 Barthes, Roland. Incidents. Berkeley: University of California Press, 1992.